As a member of the International Holocaust Remembrance Alliance, Ireland is committed to the Declaration of the Stockholm International Forum on the Holocaust (2000) and the implementation of national policies and programmes in support of Holocaust education, remembrance and research. Ireland became a full member of the International Holocaust Remembrance Alliance in December 2011. Prior to this Ireland was an observer country to the Alliance from December 2007, progressing to liaison country status in June 2009. Ireland’s work to implement the Declaration of the Stockholm International Forum on the Holocaust are undertaken by a broad range of stakeholders, including the Department of Justice and Equality, Department of Education and Skills, and Department of Foreign Affairs and Trade, along with civil society organisations including Holocaust Education Trust Ireland, the Irish Jewish Museum, and academia. The subject of the Holocaust is addressed in a number of syllabi in the Irish secondary education system most notably History and Jewish Studies. It can also be studied as part of Civic, Social and Political Education, and Religious Education. While junior cycle education will see significant change between 2014 and 2020, the commitment to ensuring that all students receive education in key human rights issues will remain enshrined in the new curriculum. In addition the Holocaust can be addressed as a project or as a theme in Transition Year (taken usually when students are aged 16) during which a flexible curriculum allows for special projects be undertaken at the initiative of schools, coordinators, and teachers. For those students who opt for Leaving Certificate History, the study of key events and concepts relating to the Holocaust forms part of one of the most popular options on the course. In 2005 Holocaust Education Trust Ireland (HETI) initiated The Crocus Project in schools throughout Ireland. Children aged eleven years and upwards are presented with yellow crocus bulbs to plant in autumn in memory of 1.5 million Jewish children who perished in the Holocaust and thousands of other children who were victims of Nazi atrocities. The activity presents an opportunity to introduce young children to the subject of the Holocaust. It is a tangible way to stimulate discussion and create awareness about the dangerss of discrimination. The Crocus Project has grown to include primary and post primary schools in Ireland and has welcomed the participation of school children from several European countries. The total participation of school children from Ireland and Europe in the Crocus Project is currently 45,000. With the support of the Department of Education and Skills, Holocaust Education Trust Ireland runs a number of teacher education programmes on the Holocaust. These programmes involve lectures, seminars and interactive workshops and materials and assist teachers in bringing the complex subject of the Holocaust into their classrooms. Some of the programmes include study visits to Holocaust related sites. 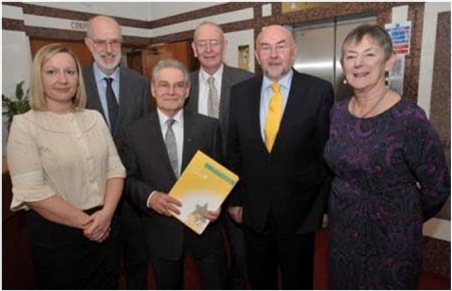 In 2009/10 HETI introduced a Certificate in in Holocaust Education which is awarded by Trinity College Dublin. This year long programme comprises four modules and is recognised as Special Purpose award at NFQ level 7 carrying 20 ECTS. Holocaust Education Trust Ireland also facilitates visits to schools by some of Ireland’s small number of Holocaust survivors. Meeting with Holocaust survivors and hearing their personal testimony can prompt listeners to consider the Holocaust and its consequences. Each student is presented with a comprehensive booklet about the Holocaust which is studied at school or brought home – hence raising awareness about the Holocaust throughout the country. Approximately 10,000 students participate in this programme every year. Outreach education continues to develop in the form of public lectures, cultural events and exhibitions. In 1948 approximately 100 Jewish Slovak children, who had survived the Holocaust, spent one year of respite and recovery in Clonyn Castle, Co Westmeath. HETI arranged for some of them to return to Ireland in May 2013 when they shared their memories and reminiscences after 65 years. On 1 May, Mr Eamon Gilmore T.D., Tánaiste (Deputy Prime Minister) and Minister for Foreign Affairs and Trade, addressed this gathering. HETI’s partners for this project were: the Irish Jewish Museum, Delvin Historical Society, the Royal Dublin Society, the Jewish Representative Council of Ireland and the Dublin Hebrew Congregation. In association with Trinity College Dublin, HETI also organises an Annual Holocaust Memorial Lecture each year. It attracts a capacity audience of 400. In recent years this lecture has been delivered by distinguished international scholars some of whom have included: Jeffrey Herf, Christopher R Browning, Richard J Evans, Jan T Gross and Dr Jay Winter. The Irish Jewish Museum and Irish Jewish Historical Society are also active in providing educational resources and regular lectures on a range of topics, including the Holocaust. In 2012 the Museum participated in a radio and television programme on the Holocaust broadcast by Raidió Teilifís Éireann, Ireland’s national television and radio broadcaster. Ireland has hosted a national Holocaust Memorial Day commemoration on the Sunday nearest to 27 January (United Nations International Holocaust Memorial Day) each year since 2003. 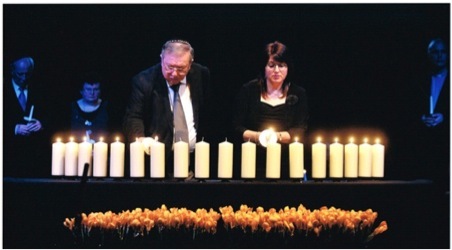 The President, Taoiseach (Prime Minister), Tánaiste (Deputy Prime Ministers), the Minister for Justice, and other senior Government ministers have all addressed the Holocaust Memorial Day ceremony in recent years. The national Holocaust Memorial Day commemoration event is organised by Holocaust Education Trust Ireland, in association with the Department of Justice and Equality, and Dublin City Council. 700 people attend the event and approximately 40 people participate in it from all walks of Irish life. 100 school children attend and 12 of them read from the Irish Scroll of names. The commemoration cherishes the memory of those who perished and recalls the millions of Jewish men, women and children and others persecuted during the Holocaust. The ceremony is both commemorative and educational and includes carefully chosen readings from primary sources, survivors’ recollections, candle-lighting and music. All of the participants in the programme are chosen with care and make a significant contribution by their presence as well as their readings. 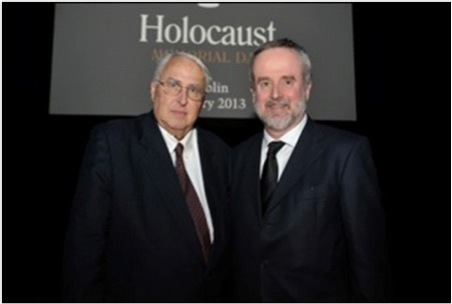 In January 2013 the Advisor to the International Holocaust Remembrance Alliance, Dr Steven Katz, visited Ireland to take part in the national Holocaust Memorial commemoration event. During his visit he also met with the Minister for Education and Skills, Mr. Ruairi Quinn T.D., with officials from the Department of Justice and Equality, and the Department of Foreign Affairs and Trade, and with academics, students, and representatives of religious groups. 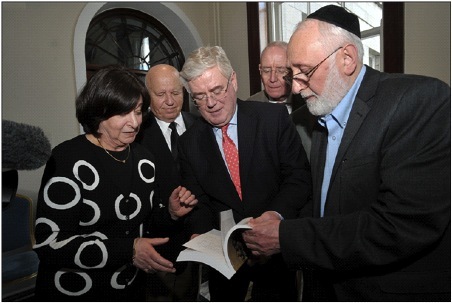 He also delivered a public lecture at the Irish Jewish Museum. The Irish Jewish Museum also contains a small Holocaust-related exhibition, and the subject of the Holocaust is including in talks given to students from all over Ireland on a regular basis. Last year the Museum welcomed approximately 8,000 visitors. The area of Holocaust research is at an early stage of its development in Ireland. Modules on the Holocaust are now included in some third level courses in History, Jewish Studies, Film Studies, and World Religions and Theology although there are no dedicated and exclusive third level degrees on the Holocaust at any of the universities or places of higher education in Ireland. The Herzog Centre and the Department of Near and Middle Eastern Studies in the School of Langauges, Literatures and Cultural Studies at Trinity College Dublin now embed the Holocaust in modules in all four years of its undergraduate degree programmes. Also a large number of students now write their final year dissertations on Holocaust related subjects. There is a joint School of War Studies at Trinity College Dublin and University College Dublin, which has also begun to look at modules about the Holocaust. Holocaust Education Trust Ireland and the Herzog Centre offer a Certificate in Holocaust Education, which is awarded by Trinity College Dublin. 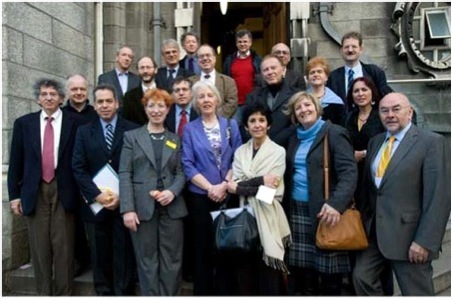 In November 2010 Holocaust Education Trust Ireland, with the support of the Department of Education and Skills and the Department of Foreign Affairs and Trade, organised an international academic conference on Antisemitism and Holocaust Denial in Trinity College, at which 14 international scholars attended, and presented papers. A comprehensive volume of these papers is being produced.